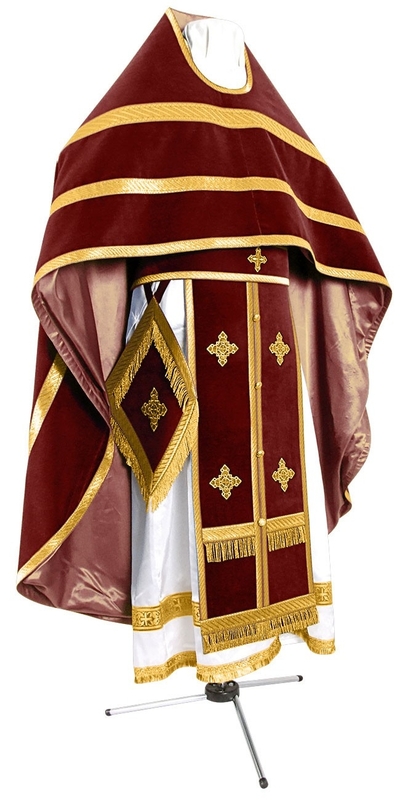 Orthodox Church liturgical Russian Priest clergy vestments (claret-gold) by Istok Church Supplies Corp.
Istok Church Supplies carries a splendid collection of Russian priest vestments in claret and gold. 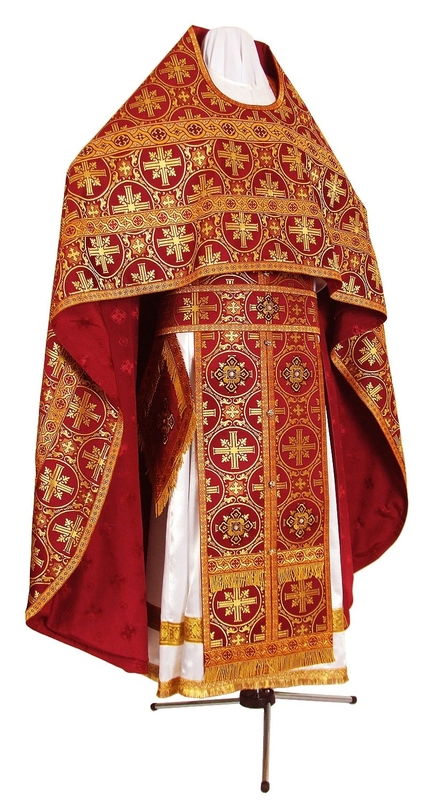 We are very proud of our ability to create high quality, handcrafted Russian priest vestments designed to fit the wearer perfectly. Our products are in traditional designs and rendered to provide many years of exceptional value. 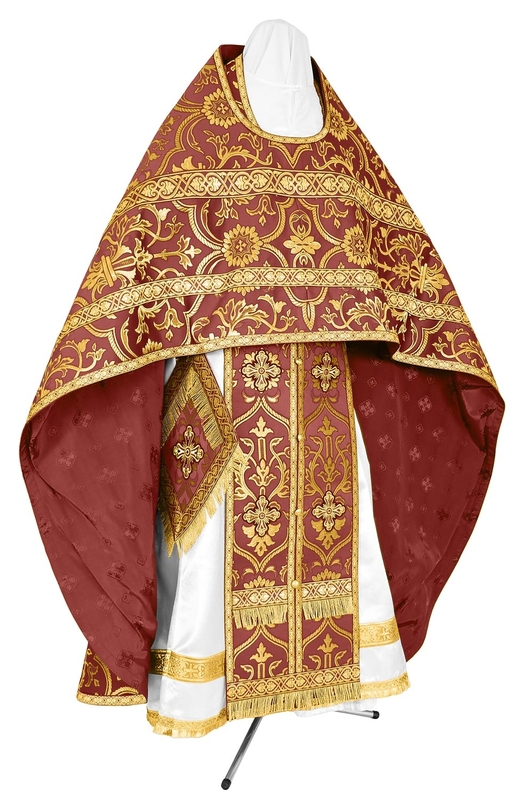 Claret is a warm, sophisticated color and our Russian priest vestments in claret and gold color combination are just the perfect choices to add warmth to church interiors as the priest conducts important liturgical services. 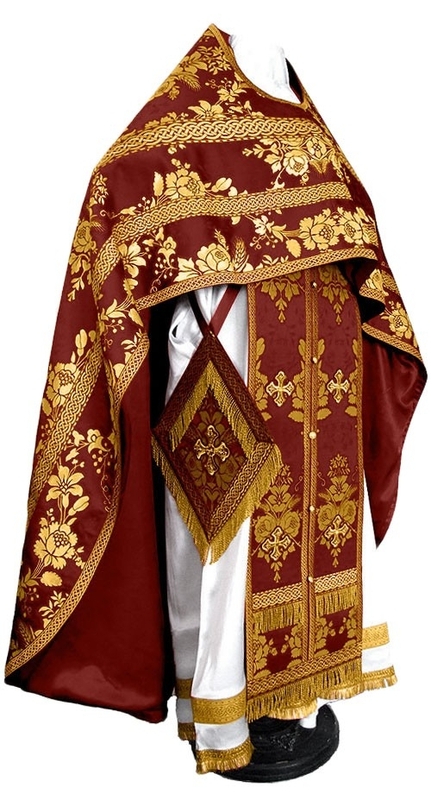 These vestments are crafted from a broad range of beautiful ecclesiastical fabrics such as rayon jacquard brocade, metallic jacquard brocade, natural German velvet and embroidered fabric. Customers who wish to purchase a particular product in a different fabric belonging to the same class as the one featured can make their request through the Notes section of their order. 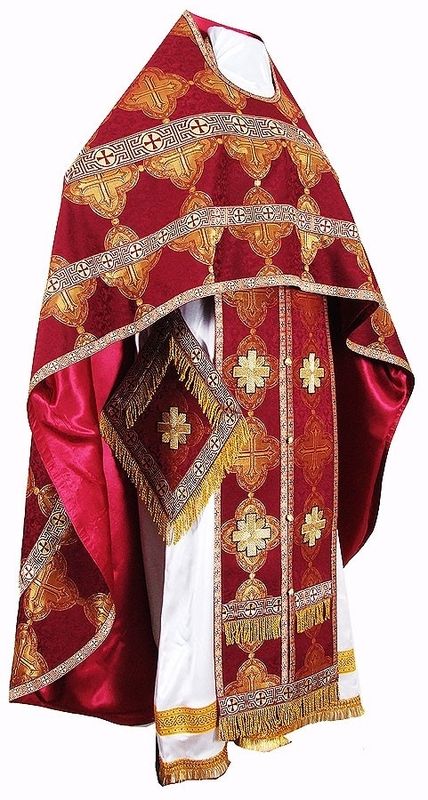 Each of our claret and gold Russian priest vestment sets is designed to be complete in itself. We include the phelonion, epimanika, epitralhilion, zone, epigonation and nabedrennik. We provide natural rayon lining for added comfort. Customers can upgrade their custom orders by opting for matching chalice covers, matching podriznik, an embroidered icon or natural velvet inserts. We offer a choice of twelve icons and customers can select depending on their requirements. 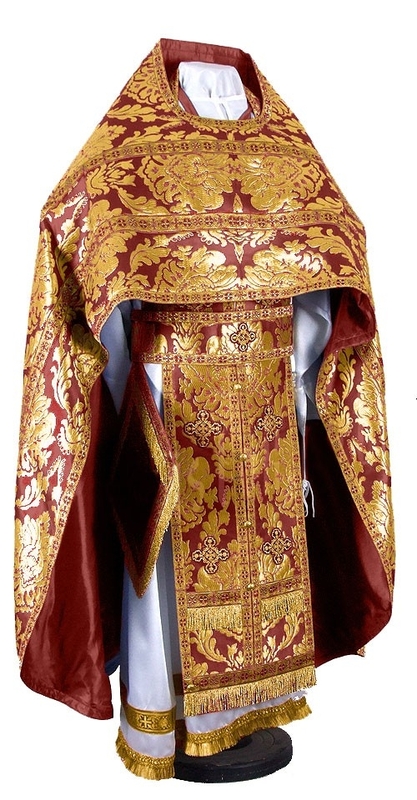 Decoration enhances the appeal of Russian priest vestments and for this, we offer three distinct types – standard, premier and luxury. 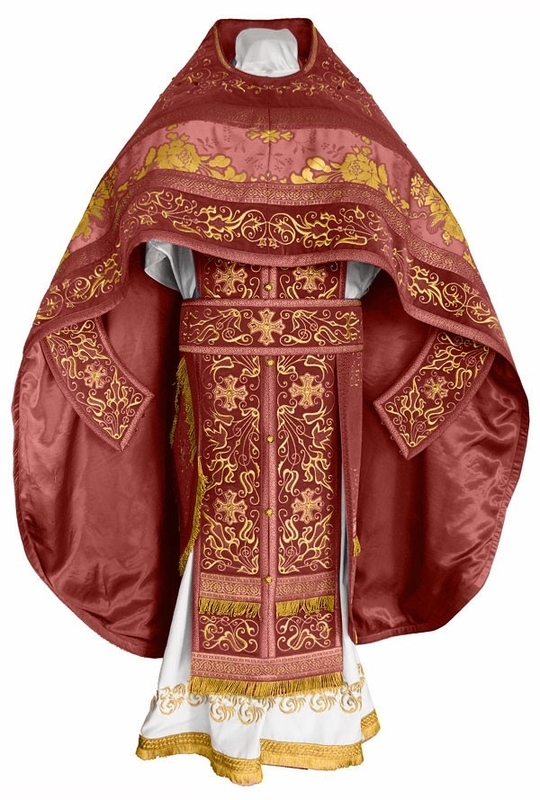 We understand the need for comfortable and perfectly fitting vestments and hence we provide custom tailoring services. 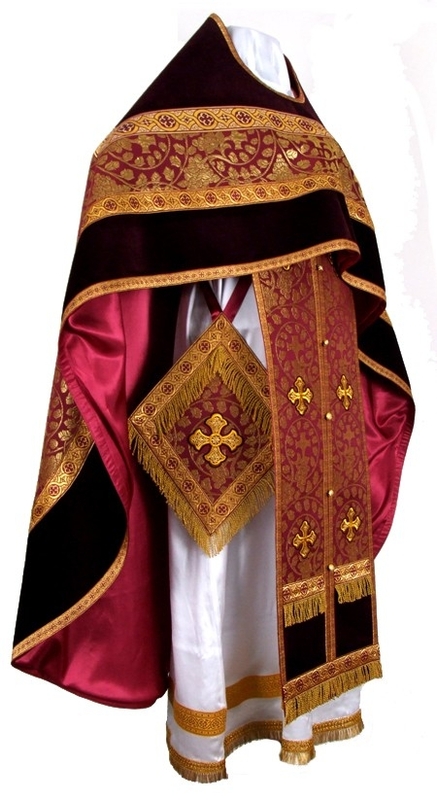 The vestments we offer are individually stitched to perfection by our dedicated and skilled tailors in Europe. We request customers to refer to our online measurement chart and send in their bespoke measurements. Our ecclesiastical tailors are perfectionists and their knowledge of Orthodox Christian vestment traditions is unrivalled in the industry. 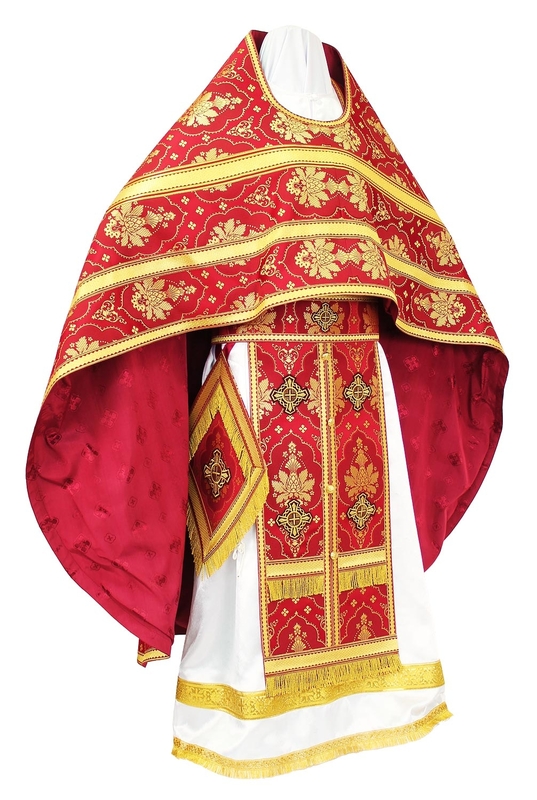 With user friendly browsing experience, exceptional array of products, marked down prices and secure payment channels, we are sure you will have a happy time ordering a bespoke Russian priest vestment!